Relationships can be similar to walking a tightrope at times. Even after being together for years, the strength of a relationship is based off the efforts, intentions and honesty of those involved. If both people aren't putting forth a sincere effort, and generally working in the best interest of both people, the dis-balance can cause subtle, yet significant problems. These periods of irregular energy and communication are bound to occur. As long as the people in the relationship stay honest and receptive to the changing dynamic of each other's needs, there is nothing they can't handle. If there seems to be a lasting element of instability and emotional tension, then the causes should be sought out quickly. If the couple is being honest and open with each other, a solution should reveal itself. If there seems to be no solution in sight and no way to deal with the current turbulence, you may be in a more toxic situation than you realized. This fact never ceases to amaze. No matter how wrong they know they are, no matter how much it would mean to you, this simple graciousness never passes through their lips. Why should it? You are the one always messing everything up, being too demanding, or down right 'crazy'. Even if all those comments were true and you were just a hellion storm on legs, no one is perfect. We all can run out of patience and snap. After committing acts unfitting the situation, most people, very compassionate and real people, will want to make amends. If your partner never admits fault or clearly doesn't approve of the humbling act of apologies, don't focus on why they claim to do it. A clever person can justify buying dust in the desert. If you cut out the sound of their petty arguments you will notice a pattern. In most situations like this, the unapologetic party is refusing to learn from mistakes and life lessons and is using their partner as the scapegoat. They are perfectly content to use your love and sacrificed self-fulfillment to pad their hard headed ways. Remember that insecurity is fear's specialized relative. It binds together and fuels a wide variety of destructive and counterproductive action. 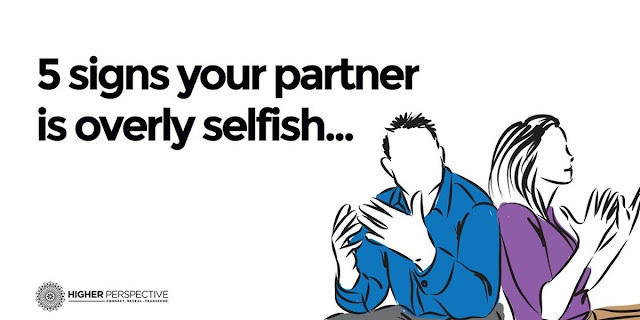 Your partner's insecurity can manifest as hyper competitiveness, fast acting jealousy, attention seeking, insatiable greed, or even undying anger and frustration. We specifically single out insecurity because it is the more manipulative and impulsive form on the list. Don't allow your partner to be in a constant flux of grand hero to destitute victim. It is unreasonable to expect our soul mates to be invincible pillars of compassion and support around the clock. It is also unreasonable to willingly tether yourself to someone with no desire or plans to grow and overcome. Don't allow the promise of love and companionship keep you from recognizing a toxic situation when you see one. A huge part of being in love is sharing the feelings that your lover inspires in you. You get to brighten their day with the knowledge that they improved your day first. We continue to express our love and appreciation in times of life's turbulent cycles of change and adversity. When there is no acknowledgement of the love and happiness that should stem from relationships, feelings of inadequacy and insecurity arise. If the positive emotions aren't recognized, they can't be celebrated. In this absence, unproductive and ugly formations arise. Typically if someone is not acknowledging their happiness and enjoying it, they are focused on their fears. They may be afraid of abandonment, betrayal, loss, or even commitment. Emotional hang ups are to be expected; it's a rough world out there. That does not empower a person to make up for their short comings by playing master and protector to the person they claim to love. This type of relationship is vampire in nature. They stifle their victim to stay alive and healthy. If you never speak your mind and fight for what is important to you, after the years drag by you will find your inner spirit is emaciated and weak. Is the shadow of someone's love worth having to rehabilitate your spirit when it's over? Your partner should be a source of strength, love, and growth. There will never be an appropriate setting for a lover to have to knowingly and willingly harm their beloved. Even if you take it down a notch, that one night stand you picked up at the college party doesn't deserve anything but love, despite how intentions were misunderstood. There are no justifications, excuses, reasons, or loopholes that make this cruel and selfish act prettier. It is wrong, and both parties in those scenarios deserve more than that. Don't stick around to let your lover grow into a more exacting monster, and let yourself be torn apart for no reason.